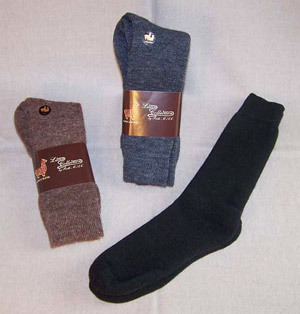 Light-weight alpaca dress socks, size 9-11, in standard colors of dark gray, navy, brown or black. 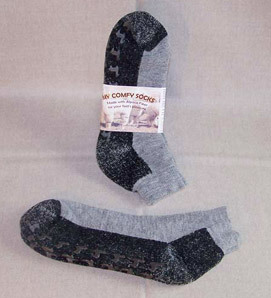 Made of 40% Alpaca/40% Dralon/20% Nylon, these are the only alpaca socks that will hold up to consistent washer and dryer treatment (in fact, they held up through the Coast Guard laundering system!). However, if high dryer heat is used, they will shrink a little each time, which is mighty useful if you prefer a smaller size. 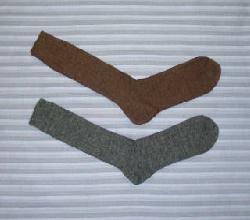 Just put them in the dryer until they fit! Then air-dry flat. Comfort Factor A: Comfy next to even sensitive skin.